This incredibly popular 22� wide by 33' long and 8� tall spaceship is just the thing to battle space aliens in. It features circular mazes inside, which can serve as team bases. Two teams can enter separate doorways and meet in the central "attack field". This unit is filled with lots of winding passageways, along with panels, walls and doors to hide-behind. The endless corridors, passageways and ambush corners which make this heart-pounding laser blasting excitement. The unit comes with a theatrical fog machine which put safe fog throughout the unit and 15 lasers. 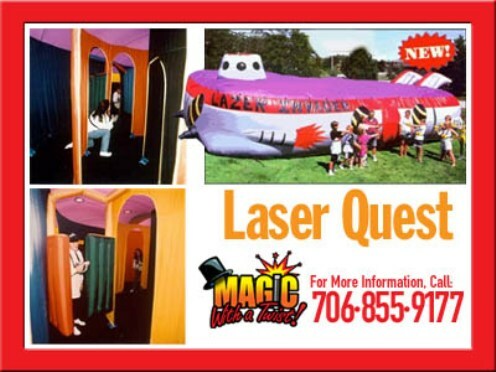 The Laser Quest requires a relatively flat area about 25 x 35' and within 100' of an electrical outlet. This unit does not have a weight limit so even the adults can play.